Jesus is truly present in the Eucharist. We hear it over and over, and we teach it to our students. Here is a craft that stresses the fact that the Eucharist is the bridge between heaven and earth, showing that we celebrate the Eucharist with the saints and angels every time we participate. 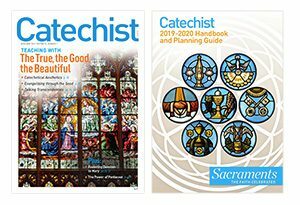 The Catechism of the Catholic Church reminds us that “by the Eucharistic celebration we already unite ourselves with the heavenly liturgy and anticipate eternal life, when God will be all in all” (CCC, 1326). The Eucharist is a window into heaven where we get a sneak peek of the heavenly liturgy. Jesus, in the Eucharist, is the bridge between heaven and earth. In doing this craft, students have a visual reminder that we are not alone when we celebrate the Eucharist. The saints and angels are joining us, too. 1. Print the Eucharist template on the white card stock. 2. Color or paint the chalice in gold. For younger students, you might want to have them just draw on their paper. On the top of the page, ask them to draw people they know that are in heaven. 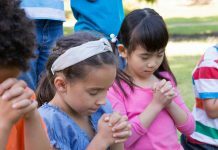 A child might wish to share their knowledge of the saints or the Holy Family, or perhaps their memories of deceased family members. On the bottom of the page, ask them to draw the people they know that are still on earth. Have them color their drawings. For older students, have them cut out pictures of people that are in heaven. They could also include the Holy Family, former popes, and saints. This could serve as a research assignment consisting of pictures of saints they have learned about or have a special relationship with, as well as saints they want to learn more about during the year. A student might also wish to include family members and friends who have passed away. Have them glue those pictures to the top of the page. 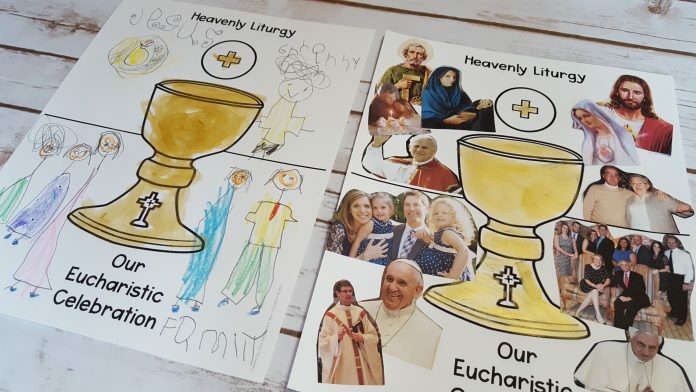 Next, have older students cut out pictures of people in their life that take part in “Our Eucharistic Celebration” on earth and glue those to the bottom half of the page. 3. It is important to explain to your students why each of these pictures or photos have been included. Remind them that, in the Eucharistic celebration, we are connecting our life on earth to the heavenly liturgy. At the Eucharistic feast, we are all together, celebrating as one community both on earth and in heaven. Let us pray, Dear Father, help us to remember that every time we celebrate the Eucharist at Mass, we are joining with the family of God here on earth and in heaven. 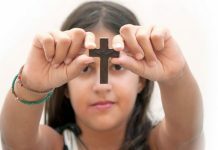 Help us to be like the saints who have gone before us to do your will. Amen.